As spring approaches, so do bottle of wine deliveries. Three club deliveries arrived in the last week, Denner, Scheid and Hahn. Scheid Vineyards is in Monterey County, sheltered on the leeward side of the Santa Lucia Range of mountains. It’s part of the Salinas Valley, one of California’s golden spots for farming. They have vineyards stretching from Monterey Bay all the way south to the county line with San Luis Obispo. This area has a very distinct taste, if you’re exploring wine, you need to visit here. Wine tasting in Monterey County isn’t as scenic as Santa Barbara’s Foxen Canyon or Paso Robles, but has equally savory wines. 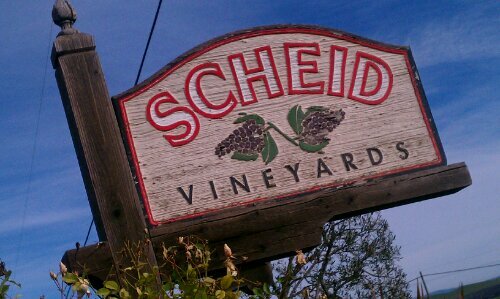 Schied Vineyards is one excellent example of great bottle of wine coming from outside Napa and Sonoma areas. It’s part of California’s Gold Coast of wine, stretching from above San Francisco Bay down into Santa Barbara, and even to Ventura. After tasting wines of Paso Robles, drive north about an hour and you’ll start seeing acre after acre of vineyards. 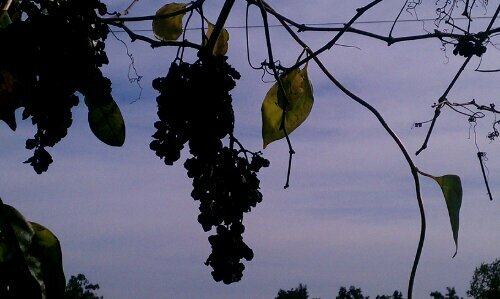 Scheid Vineyards is one of the first wineries you’ll find as you head into this rich basket of farmlands and wineries. Scheid Vineyards sits amid thousands of acres of open farmland and vineyards on Pacific Coast Highway (Highway 101) at Hobson Avenue. Their estate wine room is petite, sitting in the front of wine making buildings. Behind the wine tasting room is a patio for events and 20 or so rows of vines, samples of grape they harvest. They also make a wide range of Rieslings, Pinot Gris, Viognier, a Rhone white blend, Chardonnay, Syrah Rose, Sangiovese, a Red Rhone Blend, Cabernet Sauvignon and even a Tannat (a dry bottle of wine you’ll not often find in California.) Looking at these rankings, I think we were very discerning that day, I think we graded very hard. With their shipment, we were treated to a gift bottle of wine, a Cabernet Sauvignon (because we referred friends who became club members.) It was a very nice gift, a great thank you. Since we always love gifts, we enjoyed this 2008 Cabernet that evening, it was luscious. Of the blackberry, black raspberry, notes of coffee and chocolate they describe on the bottle, we certainly found the fruit and coffee. The rest of the shipment included a 2007 Petit Verdot Reserve, $65, from Napa Valley (Petit Verdot with just a dollop of Cabernet Sauvignon), their 2008 Pinot Noir – Clone 667 Reserve $65, and a 2007 Claret Reserve, $60, (Cabernet Sauvignon, Merlot, Petit Verdot, Malbec and Cabernet Franc. If you are looking for an interesting and different experience exploring California wines, do not miss the Monterey Peninsula and Salinas Valley. In this area you’ll also find a legacy vineyard, Chalone, that scored highly in the 1976 Paris Wine Tasting, shocking Old World Winemakers, and putting California vine on the map. Chalone does not have a tasting room but you can find their wine at both BevMo & Total Wine. None of Scheid’s wines are available at BevMo nor Total Wine. Scheid and many of the other vineyards in Salinas Valley maintain tasting rooms in Monterey, Carmel-By-The-Sea and Carmel Valley. The wine estate is at 1972 Hobson Ave, in Greenfield, CA. This entry was posted in 101 Corridor Through Salinas Valley, Cabernet Sauvignon, California Wineries - New World Wines, Chardonnay, Merlot, Monterey AVA - The Salinas Valley, Carmel & Monterey, The Pleasures of Tasting Wine, Thoughts About Wine - Exploding Ruby Flowers On Your Palette, Vinotypes, Viognier, Zinfandel and tagged bottle, bottle of wine, cabernet, california, chardonnay, estates, monterey, napa, petit, salinas, Sauvignon, scheid, sonoma, tasting, valley, winemaker, wineries, wines, zinfandel.